Jumping is a major component in the physics behind basketball. When a basketball player jumps in the air to make a shot he can appear to be suspended in mid-air during the high point of the jump. This is a consequence of projectile motion. When an object is thrown in the air it will spend a large percentage of time in the top part of the throw. A basketball player can jump as much as 4 feet in the air (vertically). And the higher he jumps the greater the hang time (the total time he is airborne), and the greater the time he will appear suspended in mid-air during the high point of the jump. Typically, there is a horizontal and vertical component in the jump velocity at take-off. The magnitude of the vertical component of the velocity at take-off will determine the time the player spends airborne (since gravity acts in the vertical direction and will act on the player to bring him back down). Thus, the vertical component of velocity, after take-off, will change with time. The horizontal component of velocity remains constant throughout the jump since it is not affected by gravity. 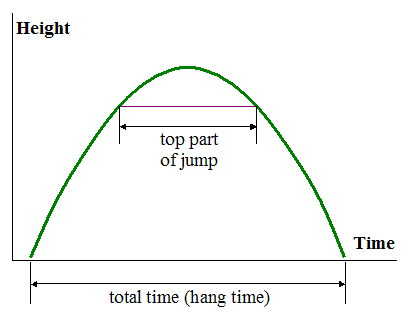 The figure below shows the typical trajectory a basketball player might travel as he makes a jump. You can visually see that almost half the hang time is spent near the top of the arc. Using some mathematics one can calculate the time spent in the top part of the jump. Maximum jump height is reached at t = V1/g. Now, set t = V1/(2g), this is half the time it takes to reach maximum height. Call this time thalf. This interesting result tells us that half the hang time is spent in the bottom 75% of the jump. The remaining time is spent in the top of the jump (the top 25% of the jump). In other words, half the jump time is spent in the highest 25% of the jump (the top part of the arc). This explains why a basketball player appears to "hang" during the jump. So, a player who can jump 4 feet vertically will have a hang time of around a second, with half a second spent in the high part of the jump. 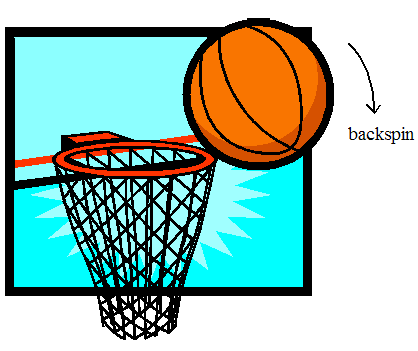 Backspin is used by players to improve their chances of getting the basketball into the net. When an object is spinning and bounces off something, it will have a tendency to bounce in the direction of the spin. This is useful for players who bounce the ball off the backboard, or the back of the net. The resulting bounce will more likely send the ball downwards into the net. Without backspin the ball is more likely to bounce away from the net. See the problem, Effective gravity acting on basketball.